This is a fresh, delicious, and pretty impressive (to non-Koreans) salad that is easy to make at home. It's colorful, full of different textures, and has a nice bite from the mustard dressing. 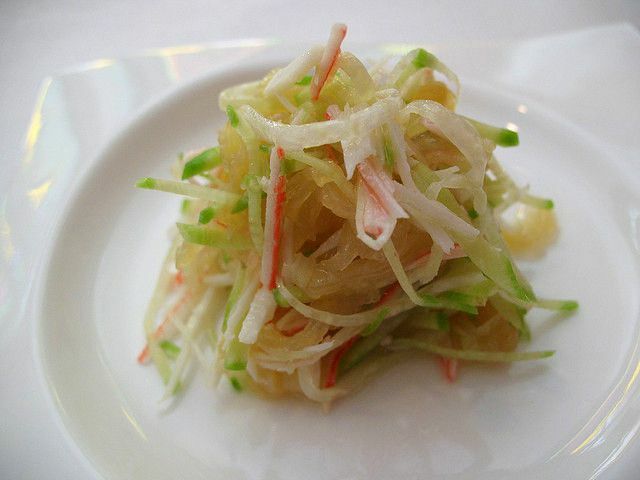 The jellyfish adds a lot of texture to the dish but doesn't taste particularly "fishy" or seafood-y, which is probably why you can eat it for years and just assume it's another mysterious root or vegetable. Soak the jellyfish in cold water for about 30 minutes to remove the salt. After 30 minutes, remove and put into the colander to drain. Pour very hot water over the jellyfish in the colander. Immediately dunk jellyfish in ice water. Drain again in the colander. Pat dry briefly and add to a mixing bowl. Add crabmeat, cucumber, and carrots and season with cucumber, lemon juice, vinegar, sugar, mustard, salt, garlic, and sesame seeds. Note: For variety, you can colorful vegetables to make this even prettier- thinly sliced red, yellow, and orange peppers and red cabbage make for an impressive rainbow salad. "Jellyfish are edible, and throughout Asia, the crunchy texture and bland flavor are just the kinds of things diners get super excited about. More than 900 million pounds of jellies are purposefully netted for human consumption on an annual basis. Gelatinous zooplankton, the scientific catchall term for jellyfish, have been drifting in the ocean for some 400 million years—they’re the oldest multi-organ animal—and humans appear to have first figured out they made for a good meal around 1700 years ago, in China." - from TakePart. "Eating dried jellyfish is highly nutritious and they contain a lot of good substances... they contain a lot of calcium binding proteins which improve memory and help to fight age-related cognitive decline. In one study 56 participants were put on a jellyfish diet and it was found that 57% of them experienced memory improvements. Normally our brain produces calcium binding proteins of its own, but as we get older these reduce in number... At the same time, dried jellyfish contain collagen which may be helpful for the treatment of arthritis and visible signs of aging once again.Jellyfish are also harvested for their collagen and this can be used in many beauty products. What Are Korean Drinking Snacks?